The queen of the gods, bride and sister of Zeus, Hera was one of the greatest deities of the ancient Greeks and later of the Romans. She was a daughter of Cronus and Rhea, and like her brothers and sisters, she was swallowed by her father. As the myth goes, she was spit out again, only when Cronus was given an emetic herb by Zeus. Click here for more details. In greek antiquity, many Greek cities claimed the honor of being recognized as the birthplace of the great goddess. According to various local myths, Hera was born in Argos and delivered to the daughters of the river-god Asterion, on Euboea, in Akraia, and in Procymna. In other accounts, the goddess was born on the island of Samos, in the Peloponnesean provinces of Arcadia and Corinth, and elsewhere. The origin of her name have never been quite clear, although it has been suggested that it was an Aeolian corruption of the Sanskrit word swar, which means sky. In any case, it is certain that Hera was a genuine Greek goddess, patron of agriculture and vegetation-an identity she acquired after her union with Zeus, when she became the queen of the heavens. 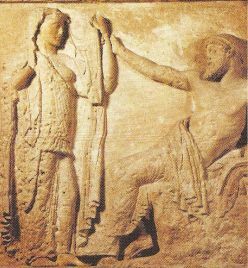 In Greek mythology, there are numerous versions about where and how Hera and Zeus united for the first time. Homer, in his Iliad, claims that their union took place in the land of the Hesperides, while Pausanias claims that Zeus disguised himself as a cuckoo to seduce his wife on Euboea. The goddess fulfilled the ancient greek profile of the ideal woman - beautiful, modest and completely faithful to her husband, despite his numerous affairs with other women. Her husband's gross infidelity made her always furious and very vindictive. Their quarrels became increasingly frequent and intense. In one such moment of frustration, it is said that the goddess gave birth to the war god Ares, as a result of her mere contact with a flower. According to other myths, she also gave birth to Hebe, the goddess of eternal youth, after simply dining on a lettuce. Other myths attribute many children to Zeus and his wife, and suggest that Hephaestus was the fruit of their pre-marital relationship, while Ares and Angelos were born after the two gods were married. The goddess's rage at her husband's amorous adventures knew no bounds. At one time, she even conspired with Athena and Poseidon to overthrow him. She would have succeeded if Thetis had not rushed to Zeus's assistance by bringing the hideous Hecatoncheiras Briareus (one of the hundred handed giants) from Tartarus to Mount Olympus and seating him next to Zeus, thus scaring off the rebels and forcing them to cancel their plans. Delayed Alcmene's childbirth by nine days, then sent a serpent to strangle the infant Hercules. Click here for details. She chased Io, who had been changed into a cow, and then had the many-eyed Argo to guard her. The goddess's tendency for revengefulness was shown in other cases as well: A prime example was the crisis triggered by Paris, who chose Aphrodite over her in the famous beauty contest that later led to the outbreak of the Trojan War. In a show of spitefulness, in the Trojoan campaign that ensued, Hera took the side of the Greeks, thus bringing many calamities to the Trojan camp. In another instance, she was equally harsh in her punishment of the daughters of Proetus, either because they claimed to be more beautiful than herself, or because they showed contempt for her sanctuary at Argos. 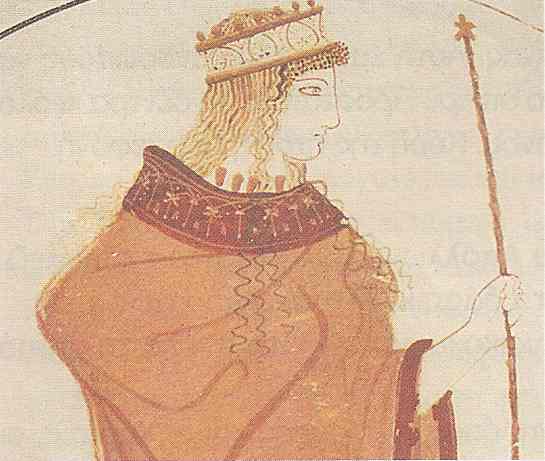 The queen of Olympus was worshipped in all Greek cities and foreign colonies. Outside Greece, the her Temple at Lacinia near Croton was the center of a massive celebration; the head of the statue of Hera Lacinia was the symbol of the alliance formed by the Greek cities of Lower Italy and Sicily. In the Greek world, the main centers of the worship of the goddess were at Argos, Sparta, and Mycenae, while in historic times, there were temples dedicated to her-known as Heraion-at Argos and on the island of Samos. 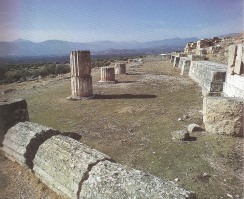 Grand festivals were held in honor of the goddess throughout Greece. These festivals were known as Heraia and included athletic competitions, processions, dancing and animal sacrifices known as Hecatombae. The goddess's gold throne, scepter and crown were the symbols of her power. Her favorite animals and birds were the peacock, the cow and the cuckoo. Her favorite plants were the lily and the pomegranate.